I am so happy to be able to share this lovely guest post with you! Beth is a prolific eBrush artist and is very active on the eBrush by Craftwell Facebook group. She is very inventive and creative. I hope that you will join and interact with all of our members! Good day eBrush fans. This is Beth the Glitter Queen with a totally gorgeous Valentine’s card to share with you. I wish you could see it in person as the photo does not do it justice. Grab a cup of coffee or drink of your choice and join me on a crafting adventure using the eBrush. I had to do some modifying of my original technique to use with the eBrush and when I finished the card I thought why didn’t I eBrush the tissue paper first. I used acrylic floor wax but you can substitute white glue that you have thinned. I prefer the acrylic floor wax as I get more of a translucent look plus I happen to have a bottle left over from making Christmas ornaments a couple of years ago. I would rather be crafting than waxing floors. Let’s get started. Supplies you will need. Thin plastic I use plastic from page protectors. An embossing folder. I used a Darice one. I don’t know the name of it. As well as some kind of embossing machine. Tissue wrapping paper. Acrylic floor wax or white glue which you have thinned with water. Of course your eBrush and markers of your choice. I used Spectrum Noir markers from the purple set. Ultra fine or fine Glitter is optional. 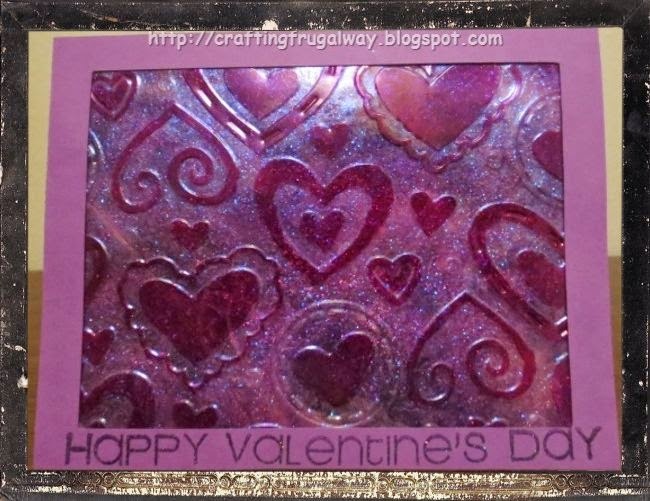 Normally I use just one color but for this card I used several different colors. If you wish to color the embossed plastic then markers which will work on plastic. I used a Sharpie. First you will run your plastic through your embossing machine. Ebrush your wrapping tissue, Do a larger piece than the size of your embossed plastic as you may need to do some patching. Then decide whether you want to use the embossed side as your front or the debossed side. You will get a slightly different look if you use the debossed side as the front. Take either your glue or your floor wax and using a sponge brush apply to the back side of the plastic. Place your tissue paper over the plastic and use the sponge brush to adhere it using a pouncing motion. Don’t panic if you should get a hole. Just tear off a small piece of tissue paper and patch the hole. Once the tissue paper is down tight while it is still wet you will sprinkle glitter if you are going to use it. I like to lightly sprinkle my glitter and do it in layers. I like to turn the piece over as I work with the glitter to see how it is looking in the front. Another reason for having a larger piece of wrapping tissue as you can turn your plastic panel over to look at it without getting your hands messy. When you are satisfied let dry. trim to size and then finish your project. This technique can be used for more than just cards. 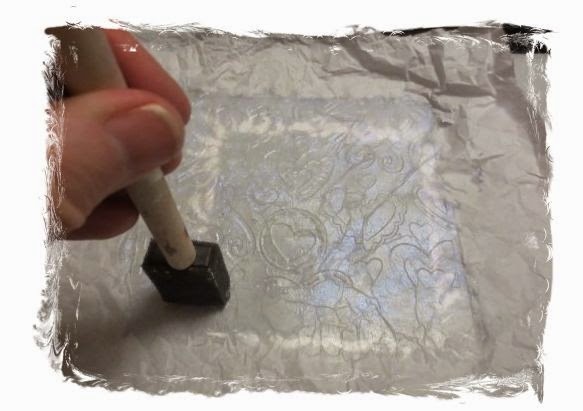 If you have an embossing machine which will hold larger embossing folders you can use this technique to make an insert for in a glass container and use a battery operated candle. Of course you can also do this technique without embossing the plastic. You can even stamp on the plastic using an ink like Stazon and adhering the tissue paper to the back. I hope you will try this technique. It is a fun technique and the results are stunning. Thank you for stopping by. Very creative, Beth, this gives a wonderful effect. Sue’s Paper Crafts – My personal Blog! Congratulations on being guest designer. Your card is very creative and I enjoyed reading about the process. Nice post,thanks to the sharing this blog post. Download Tubemate for PC provides you with easy and fast download features. Tubemate can also be used to download videos from various websites. Tubemate Apk is a favorite app for android users for video downloading. Now Tubemate app is available for PC as well as MAC users.